In 1989 we sold our milk cows and bough a team of Belgian horses and an old rubber tired wagon. We did not know how to harness a team, so I asked my dad if he would help me. My dad used to work the fields using a team and plows. We finally got it all fixed and climbed into the wagon and that was my first run-away. There have been several since that time. 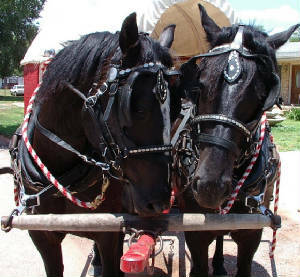 The first trip we took in our wagon was to Elk City, OK along with several others in this wagon train group. We now make trips to Shamrock, TX, Canadion, TX and Elk City, OK. We have enjoyed being part of the wagon train and meeting lots of people. We have had a few wrecks and near wrecks. 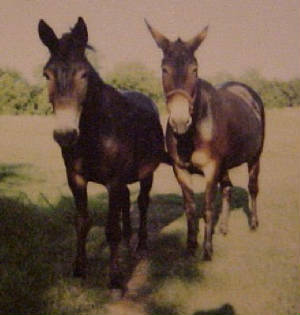 We now have a team of sorrel mules which is the 5th team I have owned since I joined the wagon group. Doyle started riding with the wagon train in 1990. He would ride a horse usually with one of his children or friends. He rode the first leg of the Pack Saddle Bridge trip and several trips to Elk City. He remembers riding to Coyote Hills from Cheyenne also. My wife would never go with me, but said if I would build a wagon like the others had, she would go with me. My first wagon was on a motorcycle frame and was like a little buckboard with just a seat and back bed. She helped paint it and went with me on a ride from the McClellan place to Cheyenne. I was using two Shetland type ponies to pull. I bought a Percheron stallion in KS and for the past four years have been raising and training the new team. 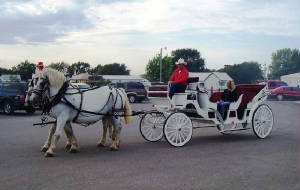 They are Mustang/Percheron combination and we made our first parade in Shamrock, TX. 2002. We were tied to Jim's wagon for safety as they was a large crowd in that parade. I had them in Sayre parade the next weekend for the first time solo. I have been in several other parades now and the team is doing great. See picture of Tornado & Stormy below.